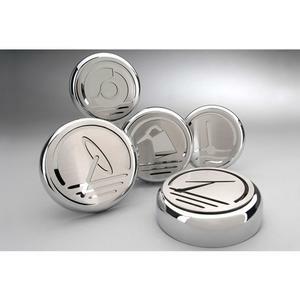 Dress up your Camaro SS V8 with our Chrome/Brushed Stainless Steel, (5) Piece Executive Cap Cover Set. These trim pieces are designed to fit all 2010-2013 Camaro over the stock engine caps and add a clean stylish look to your Camaro engine bay. ■ (5)Chrome Caps with Brushed Stainless Steel accents. ■ Will not tarnish, fade or rust. ■ Adds a unique look and style to your car. ■ Easy peel and stick Velcro installation takes just minutes. ■ Fits all 2010-2013 V8 Coupe and Convertible Camaro's with Auto Trans.